* If you prefer, you can see a .pdf version here (3.04 Mb). As 2012 quickly comes to a close, the last few months have been a wonderful time of much change and transition for us. 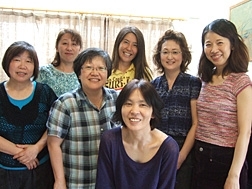 Here is a quick update on our ministry in Osaka & Nara. As we mentioned in our last letter, the church was preparing to move out of our rented space and make the transition to a more organic type meeting in the home of one of our church members. Well, the move in August went well, and we are slowly adjusting to a new way of gathering together to seek and worship Jesus. The relational atmosphere that comes from meeting in a living room is allowing us to explore different ways of worshiping God and new ways of studying the scriptures together. As a result, those who gather at our weekly meetings have opportunity for more interaction, more participation and more ministry to one another. In the end, we hope that this will also lead to more growth and maturity for the entire church family. There has also been an increase in fellowship as we share a meal together each week. Since we had no kitchen facility in our old building, this has been a wonderful addition to our Sundays together. PLEASE PRAY for the entire church family as we continue to adjust this new way of meeting. May Jesus be the true center of the church as we seek Him with hungry hearts, study the Bible with open hearts and serve one another with willing hearts. On a related note, since our new meeting place is no longer in the city of Sakai (we are now in the neighboring city of Izumiotsu), we are considering changing the name of the church. PLEASE PRAY that the Lord would speak to us clearly in this matter. As we hear from Him regarding a name, we believe that it will also give a sense of identity and a hint of who the Lord wants us to be. The moving of the church has had a major impact on Michael's daily schudule. He used to take the train to the church office 4 times a week. However, since the church no longer has an office, Michael now needs to work from home. While this is nice in some ways (he avoids having to spend 2+ hours on a crowded train each day! ), he is also finding it a bit more difficult to be productive. There are just too many distractions at home. PLEASE PRAY that Michael would establish good time management skills while at home so that he can accomplish the many things he needs to do. Also, PLEASE PRAY for Michael's Japanese studies. Now that he has a bit more free time, he wants to renew his language studies. After 15+ years in an international (i.e. English-speaking) setting, his Japanese ability is still very weak. However, now that we are in a more relational-style church setting, being able to communicate well in Japanese is more of a necessity. Currently, he is trying to study by himself 4-5 days a week. Please pray for much discipline. 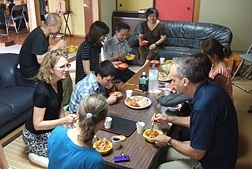 Michael is also serving once again as chaplain at Kansai Christian School (KCS). Through the theme "Following Jesus," Michael desires to challenge the students to walk in authentic relationship with Jesus. PLEASE PRAY for him as he gives the messages at the all-school chapel (usually the first Friday of each month). Last year, Chris began serving at KCS as a teacher's aide for the 1st-2nd grade class. This year she is continuing in that role, but has also a second role: homeroom and Bible teacher for the 5th-6th grade class. While she really enjoys this new opportunity to serve the students and teach the Bible to them, this new position demands much time and responsibility, and Chris is often very tired. PLEASE PRAY for Chris as she continues to adjust to this new schedule. May the Lord give her physical, emotional and spiritual strength to accomplish the tasks that He has given to her. Chris is also currently teaching a woman's Bible study two times a month. This is a group of 5 or 6 women who want to gather and study God's Word together. PLEASE PRAY for Chris as she leads this group. May the Lord give her wisdom and insight to help these women go deeper in their walk with Jesus. Luke started 6th grade in the Fall and is doing well in school (despite having his mother as his homeroom teacher!) He continues to study the piano (he is currently learning a crazy fast song: "Moonlight Sonata- 3rd Movement"), and is now about 6 inches taller than Chris. Since the church moved in August, he has also become an active participant in our weekly gatherings; sharing, discussing and praying along with the adults. He is also preparing to get braces on his teeth at the beginning of 2013. PLEASE PRAY for Luke's continued spiritual, emotional and academic growth. Well, that is about it from our side. We hope that you are all doing well as we head into the wonderful Christmas season. More and more may you experience the wonder of Immanuel, God with us. As always, thank you for your many prayers and support.